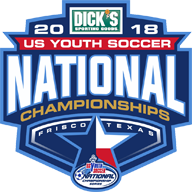 FRISCO, Texas (July 5, 2018) — US Youth Soccer is proud to announce the 16 champions of the 2018 US Youth Soccer Eastern Regional Championships, and commend their success in the state and regional championships of the US Youth Soccer National Championship Series, the country's most prestigious national youth soccer tournament. 12U Boys* FCUSA Baltimore, Md. 12U Girls* MRM Academy Coyotes Blue 06 Germantown, Md. 13U Boys Ukrainian National 2005 Black Horsham, Pa.
13U Girls Pipeline SC Pre-Academy Baltimore, Md. 14U Boys Real Jersey FC Medford, N.J.
14U Girls Philadelphia SC Coppa Swarm 04 Philadelphia, Pa.
15U Boys Beadling Elite 2003 Pittsburgh, Pa.
15U Boys # GPS NY Regional Team Buffalo, N.Y.
15U Girls Keystone FC Premier 03 Mechanicsburg, Pa.
16U Boys Arlington SA 2002 Red Arlington, Va.
16U Girls North United Rush Pittsburgh, Pa.
17U Boys OBGC Rangers Blue 2001 Olney, Md. 17U Girls BC United 01 Binghamton, N.Y.
17U Girls # FC Stars 01 Acton, Mass. 18U Boys Baltimore Celtic SC 00 Baltimore, Md. 18U Boys # Baltimore Bays 00 Baltimore, Md. 18U Girls Century V Gold Pittsburgh, Pa.
19U Boys Baltimore Celtic SC Christos Baltimore, Md. 19U Girls FC Pennsylvania Strikers St. Davids, Pa.
# Advances to National Championships as Eastern representative. 15U Boys Beadling, 17U Girls BC United and 18U Boys Baltimore Celtic to represent the National League. *There is no 12U age group at the National Championships. Maryland led the way with six Eastern Regional Champions, and Eastern Pennsylvania followed with four. Pennsylvania West added three champions, while New Jersey, New York West and Virginia each had one team apiece win a title. Of the nine teams who entered the tournament looking to defend their titles, five managed to win back-to-back Eastern Regional Championships. Those sides included 14U Boys Real Jersey FC (NJ), 15U Boys Beadling Elite 2003 (PA-W), 17U Girls BC United 01 (NY-W), 18U Boys Baltimore Celtic SC 00 (MD) and 19U Boys Baltimore Celtic SC Christos (MD). Regional Champions in the 13U through 19U age groups now advance to the third and final stage of the quest for the National Championship. These Eastern Regional Champions will join the 40 National League qualifying teams as well as the champions from the Midwest Regional Championships, Southern Regional Championships and Far West Regional Championships for the National Championships in Frisco, Texas, July 23-29.